Welcome to Galway! 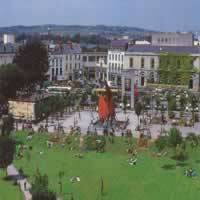 Arrive at your hotel, check in and then grab a bite to eat around Eyre Square before exploring the city on foot. First check out the county courthouse, built in 1818, and acclaimed for its design and architecture as well as the Town Hall, home of the most popular theatre in Galway. 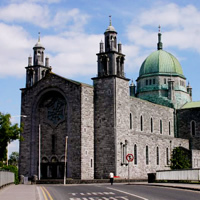 Next, cross the famous Salmon Weir Bridge, where you will find the Galway Cathedral located on Nun's Island, on the west bank of the River Corrib. Built in the Renaissance style, it was the last large church in Ireland to be made from stone and the artwork, glasswork and woodwork were all handcrafted by Irish artists. Following your visit of the Cathedral, make your way toward St. Nicholas' Church where Christopher Columbus is said to have prayed in 1477 before setting sail on one of his attempts to reach the New World. Nearby you will find Lynch's Castle, ancestral home of one of the original 14 tribes of Galway as well as Lynch's Window, commemorating one of Galway's most enduring legends. Also worth a visit is the Nora Barnacle House. Nora Barnacle, the wife of James Joyce, was born in Galway; and the Barnacle family home is now a small private museum with letters, photographs and other exhibits from the lives of the Joyce's. 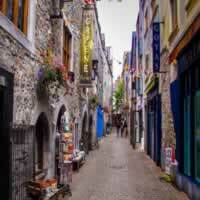 Later, walk along the quay beneath the legendary Spanish Arch before stopping into the Galway City Museum. This evening, you can continue to Salthill to stroll the prom (promenade) and have dinner at one of the many restaurants or cafes, or enjoy the 'craic' and a few pints at one of the many pubs to be found on Kirwan's Lane in Galway's Latin Quarter. Wake up early this morning and admire breathtaking natural vistas as you travel through the Irish countryside to the ancient Ross Errilly Friary in Headford. Take time to explore the medieval tombs and atmospheric cloisters before continuing on to the quaint village of Cong, the picturesque setting for the epic movie, The Quiet Man, starring John Wayne. 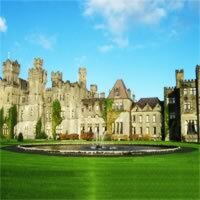 Stroll the cobbled streets and, time permitting, amble over to Cong Woods to see the 11th century Ashford Castle. Next, make your way to the Connemara Peninsula, past Loch Na Fooey, an unspoiled glacier lake, before arriving at Kylemore Abbey and Gardens. 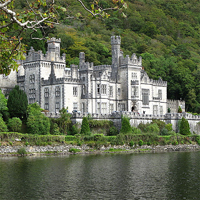 Kylemore Abbey, home of the Irish Benedictine Nuns, features a visitor center, an exhibition housed in the main reception rooms of the house, and a video which takes the visitor through the varied history of the house and the people who have lived here. Enjoy lunch in the restaurant and find unique gifts in one of the best craft shops in the West of Ireland. After visiting the Abbey, take a walk to the Mausoleum where the original owners are buried, then stroll by the lake to the neo-Gothic Church, which is a 'cathedral in miniature'. The Church was built by Mitchell Henry in 1870 in memory of his wife, who died at an early age, and is considered a building of national importance. Finally, take the shuttle bus to the six acre Victorian Walled Garden, a truly spectacular sight to see. Later, on the return journey to Galway, meander through the incredible landscape of Connemara's Inagh Valley and the Maumturks Mountains. The Connemara Loop, now part of the Wild Atlantic Way, is well marked and awes travelers with the most spectacular mountain views, mist covered lakes, prehistoric bogs, shady glens and remote, unspoiled beaches. 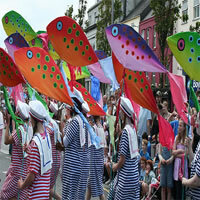 The area is dotted with traditional, but lively villages including Letterfrack, Clifden, Ballyconneely (where you'll want to stop at the Connemara Smokehouse for Connemara Irish smoked salmon served on Irish brown bread), Roundstone, Recess and Maam Cross that are hidden gems just waiting to be explored. Today, head south into County Clare to see the other-worldly limestone landscape of the Burren before making your way to the majestic Cliffs of Moher, where you can take in stunning views over Galway Bay and the Twelve Bens Mountains. 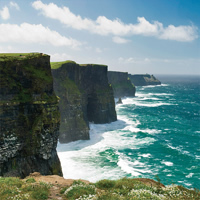 Hike the famous cliff walkway, towering more than 700 feet over the Atlantic Ocean, or take a ferry (from Doolin) out to the nearby Aran Islands. The Aran Islands are a group of three islands located at the mouth of Galway Bay featuring a unique landscape of Limestone rock, sheer cliffs facing the Atlantic, and pristine beaches. It is also a place steeped in immense cultural heritage and history where the villages are still inhabited by Gaelic-speaking communities. Inishmore is the largest of the three islands with many sites of interest including the Dun Aonghasa Fort (a World Heritage Site), Clochan-na-Carraige and Arkin's Castle. 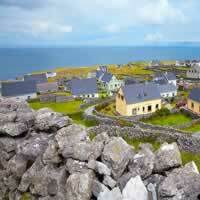 Inishmaan is the middle island and Inisheer is the smallest island with remains of several forts and churches. Enjoy hiking, cycling, swimming and diving in this beautiful natural landscape. Upon your return to Doolin, get your toes tapping while enjoying dinner and a few pints. Renowned as the capital of the traditional Irish music scene, the village's three historic pubs - McDermott's, McGann's, and Gus O'Connor's - host an array of nightly live music and Irish dance performances. While you're there, check out the Doolin Cave and its 23 foot long stalactite. Alternately, you may wish to spend the evening sipping goblets of mulled mead at one of the popular medieval banquets at Dunguaire Castle. Should you be able to spend additional days in Galway then you should consider a trip to the picturesque town of Athenry with its medieval town walls, which are some of the best preserved in Ireland. Start with a visit to the Athenry Heritage Centre on The Square then proceed to Court Lane and the medieval Athenry Castle. Also worth checking out are the ruins of a Dominican Priory, just around the corner from the castle on Bridge Street. Built in the mid 13th century, its elaborately carved gravestones are of particular interest. You may also want to visit the serenely beautiful Coole Park National Forest, former country home of the dramatist and arts patron Lady Gregory, who founded the Abbey Theatre along with W. B. Yeats and Edward Martyn. 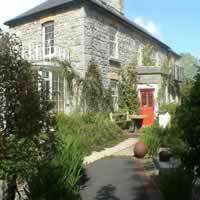 And not far away from the home of his friend, W. B. Yeats had his own summer home in Gort at Thoor Ballylee. Here, the restored 16th century Norman tower house served as the inspiration for his poems 'The Winding Stair' and 'The Tower'. Galwegians revel in enjoying themselves and the city has a reputation for artistic creativity and an infectious up-beat vibe that's played out in a full calendar of festivals and events, including the Galway Arts Festival, the critically acclaimed Galway Film Fleadh, and the glamorous Galway Races as well as the Galway International Oyster and Seafood Festival, the most internationally recognized food festival in Ireland and the world's longest running International Oyster Festival. If you are visiting during one of these festivals, be sure to enjoy the party!